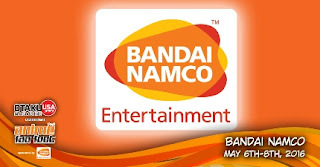 BANDAI NAMCO Entertainment America Inc. will be in attendance at Anime Fan Fest with an interactive booth on the tradeshow floor. Their booth will feature game demos that will give fans an exclusive look at their newest and forthcoming titles, fun giveaways, and more! On Friday, May 6th from 5:30pm to 6:30pm in Pepper Town, Main Events 2, join the publisher for an exclusive behind-the-scenes look at what it's like to work at the premier anime videogame publisher, get insights on the process and challenges of localizing anime-based and Japanese game content for the Western market, and be part of an exclusive insiders-only looks at Bandai Namco's upcoming titles.